Carson 3D ED Binoculars - A Winning Design? 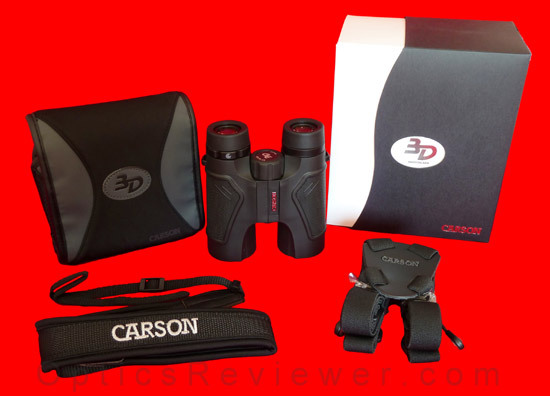 What is the Carson 3D ED binocular and why should we be interested? Good question! We met Rich Cameron at the 2012 Shot Show (an international trade show for outdoor products) and found ourselves returning to the Carson Optical booth several times to learn more about the company, its president, and its products. Let us tell you just a bit of what we learned about the company and its president. Following in his father's and older brother's footsteps, Rich Cameron went into the world of finance right out of school with a Wall Street job. Although the work was financially rewarding, he found himself unable to embrace it with any real enjoyment and left it for a position in a well-known international bank's Tokyo office during the 1980s. Once the novelty of living and working in another country wore off, Rich found himself feeling increasingly depressed by day-to-day responsibilities which were remarkably like those he had left in his previous position. Thirteen months into a two-year employment contract, Rich asked the bank to let him out of the contract. Moving on and having made friends and acquaintances in Japan as well as picking up language skills, he saw an opportunity to import products made there into his homeland, the United States. Rich moved back to the USA and began importing and exporting goods in 1990. He stored the boxes of goods in his mother's basement while calling on potential customers for the assortment of goods he was bringing into the country. He imported his first binocular in 1991 with a unique, eye-catching model that sold very well through popular catalog retailers. Recognizing the need and demand for quality optics, Rich focused his attention on optical products and the company began to grow. After having grown significantly, it becamse clear that real future growth would ultimately be achieved through providing quality goods. Rich decided to take the company in a new direction. Previously they had been importing what was already produced and available. Now the company started specifying what they wanted manufacturers to produce. Today the majority of Carson Optical products are designed and developed by Carson staff and then manufactured to its specifications. The company filed six patents during 2010 and thirteen during 2011. Indications are that they'll easily maintain that trend. Having long ago grown out of the basement of his mother's house, Rich's Carson-brand binoculars are now sold around the world from the company's headquarters in New York state. While Carson binoculars may not yet be as well-known among binocular users as some other names, after talking with Rich at the 2012 Shot Show, we were interested. (We were impressed with the samples Rich had at the booth, too!) We thought that if it were anywhere near as good as he said it was we'd like to be able to let you know about it. We ordered the Carson binocular model 3D ED to see what it was like. The 3D Carson binoculars grew out of the XM model — a Carson binocular that had been well received by binocular users, but was a bit larger and heavier. The 3D model was updated to include extra-low dispersion (ED) glass in its lenses when it became a practical possibility and thus became the 3D ED model. There aren't many Carson binoculars reviews online, so let's get this one rolling! 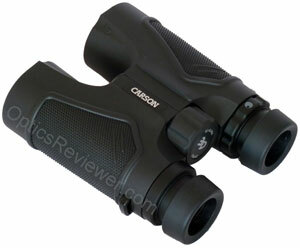 The Carson 3D ED binocular uses polycarbonate for its chassis. Many, if not most, binoculars presently produced have a polycarbonate chassis to keep weight down and durability high. It's a material that has proven itself repeatedly in a broad range of applications requiring toughness without extra weight. It's one of the reasons that the 10X42 configuration we bought only weighs 23.2oz (658g). We found that this binocular handled quite easily and it quickly felt at home in our hands. The closed bridge design allowed our ring and little fingers to circle the barrels while our middle fingers rested easily over the top of the bridge. Our index fingers felt natural in resting lightly on the focus wheel and were able to easily reach and adjust it. The binocular is armored with a firm, but not hard, rubber armoring to protect it against bumps and scrapes. Although we find that we're happy either with or without thumb indents on the bottom of a binocular's barrels, we know that some people really appreciate them. This binocular has them and they're well-placed so that our thumbs seemed to naturally land squarely in them. Of course, the armoring is a good feature and will prevent some noise as you use the binocular, but it's not what waterproofs it. The waterproofing is something separate. The Carson 3D ED binoculars are waterproofed. This involves sealing junctures where water might creep in as well as the means by which the internal focus mechanism is actuated from the focus wheel. Typically the focus mechanism is sealed by a good quality O-ring and appropriate lubricant for a wide range of operating temperatures. In the process, the air that's inside the binocular as it's manufactured is sealed inside. If that potentially moist air were allowed to remain inside the binocular, it probably would be enough to allow or even promote the growth of fungus inside the binocular. Fungi seem to particularly enjoy eating away at the various coatings applied to the lens and prism surfaces and, over a period of time, you'd notice the difference in the binocular's view. This is one very good reason why manufacturers of waterproof binoculars replace the potentially moist air with a dry gas. In the case of the Carson 3D ED, it has been replaced with nitrogen gas. This not only removes the longer-term fungus hazard, but also prevents the binocular from fogging internally at the very moment you're viewing something you've waited a long, long time to see! (At least that's the way it usually seems to work!) Yes, we still get the minor nuisance of fogging on the external lens surfaces when they're moved from a cool area to a warmer, more humid area. If that's the worst experience we ever have, we'll be quite pleased! The external fog lasts only moments, but any internal fog would take significantly more effort and time to resolve. What Kind of Eye Relief and Eyecups does the 3D ED have? The 10X42 configuration we bought and tested for this review had 16mm of eye relief, while the 8X42 configuration provides 19mm. The 19mm is enough for the vast majority of eyeglass wearers and the 16mm is usually enough for most eyeglass wearers to be able to see the full field of view without any problem. If you have reason to think that you may require a longer eye relief because of thicker eyeglass lenses or some other reason, you may wish to verify your needs prior to ordering. Of course, while we tested the 10X42 binocular for this review and like it very much, we also enjoy a wider field of view such as that provided by an 8X magnification. Given the advantages provided by the 3D ED's optics, we would certainly consider the 8X42 a solid performer with the benefit of the longer eye relief. 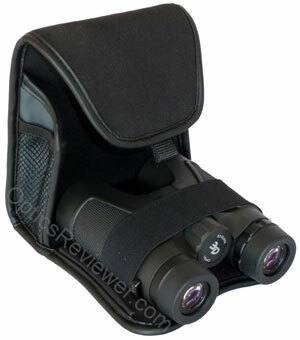 These Carson binoculars' eyecups are of the twist-up and twist-down variety. We like their sturdy action and the fact that they don't start retracting when we use them as some are prone to doing. The surface that goes against your skin is slightly beveled and felt comfortable in use. They have two positions: retracted and fully extended. In the extended position they "absorbed" about 7mm of the binocular's eye relief. The Carson binoculars company has done well for its customers by providing a relatively fast focus on the 3D ED binoculars. Our regular readers know our fondness for a focus mechanism that goes from close focus to infinity in a single revolution of the focus wheel. Any faster than that and you'll spend too much time trying to get a sharp focus. Much slower than that and you'll wear out your fingers on a fast-paced day just trying to keep the action you're watching in focus! The Carson 3D ED binocular goes from close focus to infinity in 1.25 revolutions of the focus wheel. The focus wheel is ribbed with a softer rubber-feeling coating and turns softly with a buttery smooth action and just enough resistance to keep it from going too far or fast. We like it. Some long-time binocular users find their fingers automatically&sol;habitually trying to turn the focus wheel a certain direction in trying to change from a near focus to a more distant one. For those friends, we'll mention that the Carson 3D ED binoculars' focus wheel turns counter-clockwise to adjust from nearby viewing to distant viewing. While we're discussing the focusing mechanism, it's a good time to mention the diopter adjustment. As is usually the case at its price point, the Carson 3D ED has a diopter adjustment ring at the ocular on its right barrel. While the ring doesn't lock, Carson has designed it with enough stiffness to its action that we didn't have any problems with ours accidently changing its adjustment in use. Rich told us that Carson binoculars are made by an arrangement with optical manufacturers in China which allows Carson to control quality. That's supported by a "Made in China" notation in the rubber armoring by the hinge on the underside of the binocular. The quality of our 3D ED seems to indicate that it is a good working relationship. The Carson 3D ED binocular has all of the things you would expect of a quality binocular in its price range. Its BaK-4 prisms have phase correction coating and the lenses are fully multi-coated — plus the things we're going to mention now. We appreciate the 314ft (95.7m) field of view at 1,000yds/m with our 10X42 instrument. That calculates to be a 6.0° angular field of view and that's not bad. The 8X42 calculates to a 6.5° angular field of view that's even better. It will allow you to see and monitor a significant amount of activity — something we always like. We aren't at all shy about pressing for a wide field of view! How Large is the 3D ED's Sharply Defined Field of View? To say it differently, how big is the 3D ED's optical sweet spot or the center of the field of view where details are highly resolved? We were pleased to find that the details stayed sharply defined until we got out to about 85&percnt; of the radius from the center when they started to soften almost imperceptibly. Going further out from the center, we were at about 93&percnt; of the radius before details of the viewed image began to blur noticeably. It's a very good, usable field of view. The resolution of details that our binocular achieves is excellent and exceeds the capacity of many other binoculars, even those with significantly higher prices. The easy answer is that this is the result of a combination of good ED objective lenses, quality anti-reflective coatings, phase correction coatings and very good reflective coatings for the prisms. 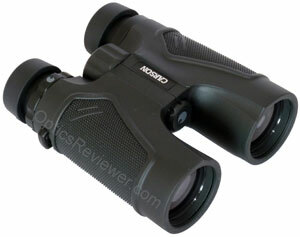 Somehow, though, Carson binoculars have exceeded what we would expect in the 3D ED's price range. One might reasonably wonder, with optics like these, if this binocular has what's commonly called "rolling ball distortion." We didn't discern any rolling ball effect with our Carson 3D ED binocular. We were able to perceive a very small amount of pincushion distortion which is often intentionally used by optics designers to avoid rolling ball distortion. This Carson binocular's pincushion was even less than we commonly see on many of the binoculars we test for it. We noticed a very slight warm (yellow) bias in the colors with our Carson 3D ED. We felt that it helped to make the images clearer and more contrasted — particularly so in bright daylight. It's not excessive and we don't think it's something the average user would be conscious of unless making quick, direct comparisons with a binocular that didn't have such a bias. Other than the very slight warm bias noted above, the colors viewed through our 3D ED looked natural. We didn't ask Carson for proprietary information, but we do wonder how they accomplished the optics in the 3D ED for the price they're charging. The chromatic aberration with ours was the least of any binocular we've reviewed in its price range and some at higher prices, including those with ED lenses. When we took our binocular out in the evening we found it to be a very good performer for viewing in low light levels of twilight and pre-dawn. The fact that the reflective coating applied to the prisms is a type of dielectric coating with sufficient layers to make it transmit light particularly well likely plays a significant role in its performance. As we used our Carson 3D ED at dusk, we noticed that it presented usable, detailed images beyond the light levels other binoculars in its price range were capable of doing. This supports the assertions the company president made to us about having pushed for high light transmission capabilities during the design process. 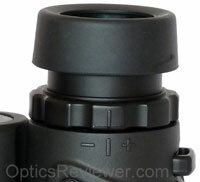 In fact, while we don't know much more about Carson's light transmission design for this binocular, we do understand that it involves significantly more dielectric reflective coatings for the prisms than used for other binoculars in its price range. We enjoy using it! If this binocular has a weak spot, this may be it. In our initial testing, we felt that it was about average in dealing with strong reflected light during the day, such as one might encounter if trying to see something in the eastern sky as the sun is rising or sunlight reflected by water, snow or ice. As we continued testing it, however, and comparing it against other binoculars in its league, we concluded that our test unit was at the higher end of average or even above average in coping with sunrise&sol;sunset conditions. As far as its ability to deal with strong light at night, when we focused on bright parking lot lights at night we observed some spiking out from the light source, but it wasn't as strong as with other binoculars in its category that we used for comparison. Carson binoculars have specifications for close focus that are good, but not what we typically look for in birding binoculars. The specifications indicate a close focus of 9.8ft (3.0m) for both the 8X42 and 10X42 configurations. We were happy to see that the actual close focus for our 3D ED was just 6.0ft (1.8m) and well under the 8.0ft (2.4m) we recommend for bird watching binoculars. Do some of them actually have a close focus of 9.8ft? We can't tell from our one test instrument, of course, but usually a company will conservatively state specifications. If the Carson binocular specifications are like most, it would be safe to say that most of the 3D ED binoculars will have a close focus comfortably less than 9.8ft. As you might imagine from the name, we found that the 3D ED binocular design provided good depth of view. That's something that not all roof prism binoculars do. Even in the 3D ED's price range we've found some that require us to adjust the focus every time we changed our viewing distance slightly. The Carson 3D ED has depth of view that gives Porro prisms a good chase (Porro prism binoculars provide a natural three-dimensional view). We felt our Carson 3D ED provided a 3-D view that was better than those of the comparison binoculars. When our Carson 3D ED arrived and we opened the box, we were delighted to find that it included a Carson shoulder harness. It was something we hadn't expected since we ordered it based only on our conversations with the Carson people at the Shot Show. We particularly like that it had a nice, thick leather "stay" to hold the straps in place when they cross in the middle of the back. The straps have some elasticity in them which we perceive as relieving some weight strain if using the harness with heavier instruments. Some binocular harnesses are designed with a larger device to hold the straps in the middle of the back, but it's been our experience that those can sometimes get sweaty during humid summer months. The Carson shoulder harness is a good one for year-around use. The main benefit of a shoulder harness is relief of strain on the neck in one of two situations: 1) the binocular seems heavy to the user, or 2) the binoculars will be carried for an extended period. There are probably other benefits, but this seems to be the one that's increasing their popularity the most. Of course, these Carson binoculars also come with a nylon neck strap, too. Ours is a little more than 1.5in (3.8cm) wide and backed with neoprene for comfort on the side that goes against your neck. We find it to be comfortable. The 3D ED's case is a cleverly creative one that Carson calls "BinoArmor." It's a neoprene case which unfolds to open&sol;folds to shut and is held closed by strong permanent magnets on both sides and in the flap that folds over the top toward the user. 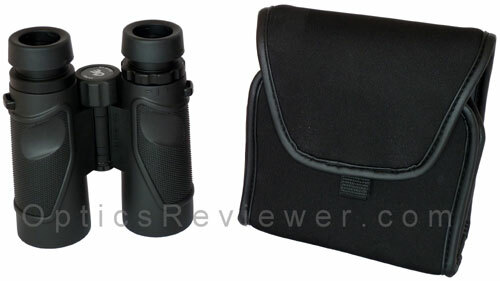 It has an elastic strap to which holds it securely to the binocular and the magnets are silent as compared to commonly used Velcro or zippers. With the binocular in its case on the neck strap or shoulder harness, all you need do is flip the top flap away from you and down. That's it. Do that and the binocular is ready for action. Because of this, there's no need for a rain guard or covers for the objective lenses since they're covered by the case. Does it work? We thought it worked well. We did notice that for some team members the case came high enough on the underside of the binocular that it hit the bridge of the user's nose when using the binocular in its case. It also blocks the underside of the focus wheel if you're accustomed to using your thumbs on it. Ultimately, we found that we liked to keep the binocular in the case when we were using it occasionally and then take it out when we expected to be using it frequently. The case worked well at keeping it covered&sol;protected when it needed to be and the binocular was free when we wanted it that way. Also included in the box is a user manual and a lens cloth. We really hate to use a cloth to clean a lens because of the risk of scratching the coatings for which we paid good money. We've found that a dirt and smudge (fingerprints!) remover like the LensPen is better than a cloth, but we really prefer the Carson Lens Cleaners (Amazon.com ) with their nano-particle cleaning formula to wipe away smudges and watermarks. Do We Recommend Carson 3D ED Binoculars? Yes, we do. We don't think you'll go wrong with the Carson 3D ED binoculars and we're confident we'll be even better friends after you use them! These links take you directly to the Carson 3D ED binoculars and the best pricing we're aware of at Amazon.com and Amazon.co.uk . 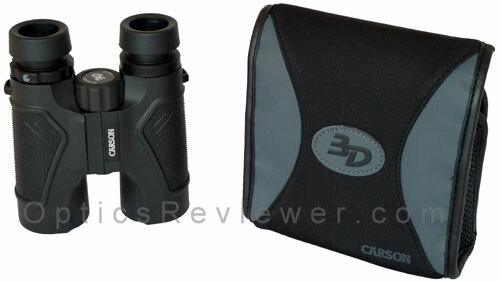 We included the Carson 3D ED in a comparison with other binoculars in the same price range. Those wanting to get the best optics for their money will want to see our Carson 3D ED comparison article. Updated September 2014: Nikon brought out its updated/enhanced Monarch 5 ED in a price range that puts it head-to-head with the Carson 3D ED as long as they both maintain their present prices. We wanted to know which one we'd choose if we could have only one binocular. We put them side-by-side in this Carson 3D ED vs Nikon Monarch 5 ED comparison. What's the Carson Binoculars' Warranty? The Carson catalog outlines its "No-Fault, No-Hassle Warranty" for it 3D ED binoculars. If your binocular is ever damaged, regardless of the cause, Carson will repair or replace them for a total cost of $15 which includes all return shipping and handling fees. If your binocular has manufacturing defect in either materials or workmanship, Carson will repair or replace them free of charge. It's well worth hanging onto your receipt for a warranty like that! Here is a video produced by Carson Optics which shows off the 3D ED binoculars and does a good job of showing how the BinoArmor case works.